Another beautiful day. We’ve had fantastic weather for the cruise―sunshine and 25+ degrees. We arrived at Izmir at 8:00 this morning. Izmir Bay, where we’re docked is a large bay lined with high-rises as far as we can see in both directions. The city before us is large and modern looking. A short walk from the ship, as we follow the crowds, is the city’s promenade―a picturesque stone walkway flanked by green grass that follows the water for several kilometers. Locals fish off the short wall that separates us from the calm blue water of the bay. 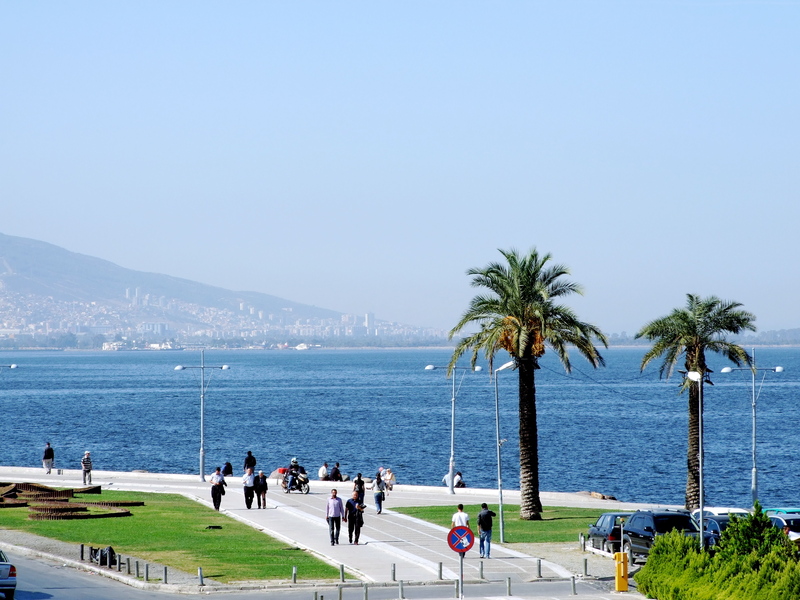 An information pamphlet tells us that Izmir itself is 3.5 million, but that the city of Pergamum is along the bay as well and part of the long stretch of high-rises we saw coming in. We opted not to join the throngs headed for Ephesis, which is a ninety minute drive. That will have to be another trip. I’m happy just to stroll along this seaside walkway. It’s not too hot yet and the breeze off the bay is refreshing. 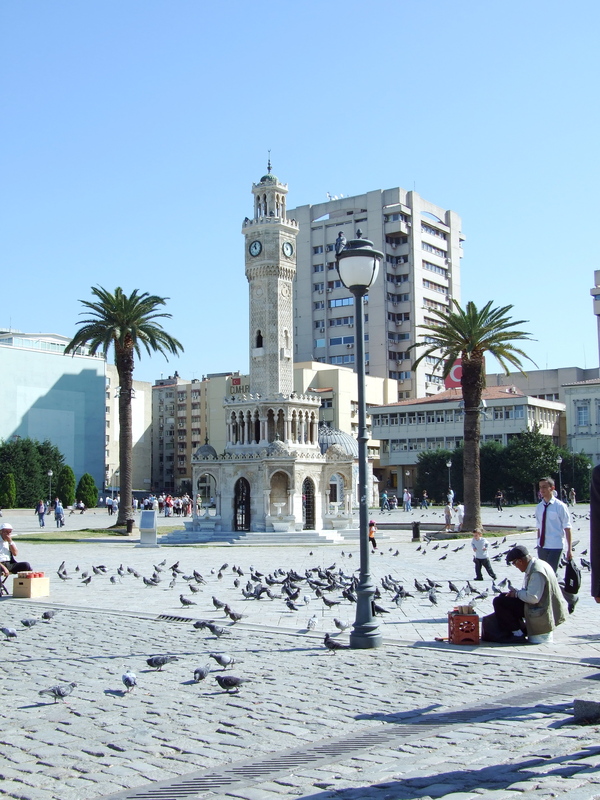 We check out the Kemeralti Bazzar and the clock tower in Konak Square, then chill with a latte at Starbucks. Afterwards, we find a small deli and decide to try some authentic Turkish food. There are several tables outside the deli with benches on one side and stools on the other. All the seats are covered with brightly patterned rugs. A man invites us to sit down and we enjoy the next half-hour learning about his country and answering his questions about Canada. He’s a learned man, he speaks English well―an IT professional, but is now working in construction because of the recession. It’s interesting watching people. Men walk arm in arm, when they’re in deep discussion―a sign of sincerity rather than fondness for one another, I think. 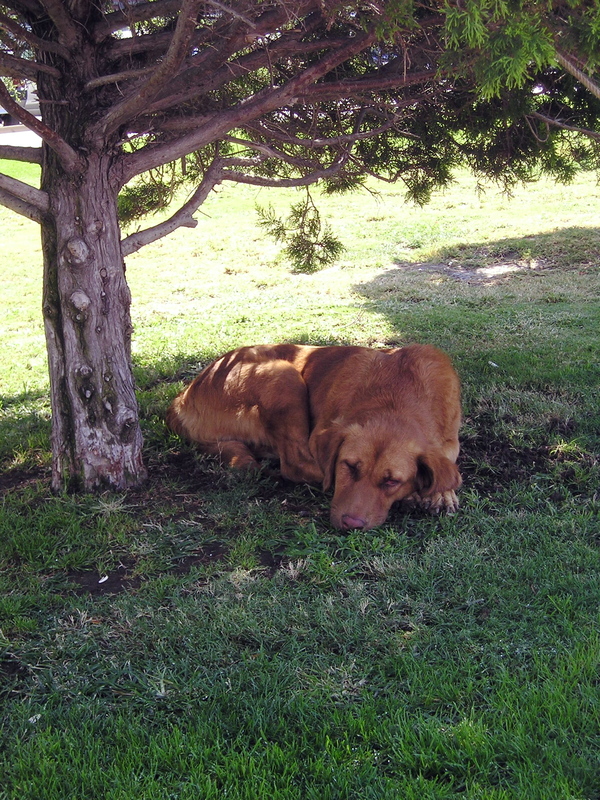 Again, there are dogs everywhere. The man at the deli explained that many of them belong to the people in the apartments, but they’re not allowed to keep them indoors, so they roam free. I noticed cats in abundance, too. They sit all around the perimeter of the outdoor cafes, seeming to know their boundaries, but nevertheless, hoping for a morsel or two. It would have been interesting, on some of our outings, to wear a pedometer to see just how many miles we walked. I ordered two appetizers at dinner tonight (they both sounded good and I couldn’t decide) explaining to the talkative waiter that I’d worked up an appetite, having walked halfway to Ephesis that afternoon. It felt that way. We really liked Izmir over-all. Cities here are not as clean as we’re used to and a clean WC (toilet) is a rarity. I found a public one today after searching for some time and was not surprised to have to pay .50 Euro. I was surprised, however, to find a hole in the floor (women squat here?) and no toilet paper. Now I’m sitting out on our balcony, enjoying the night air. We just returned from the pool deck where we had the whole place to ourselves. Funny, I thought the hot tubs would be busy at night when the air starts to cool. 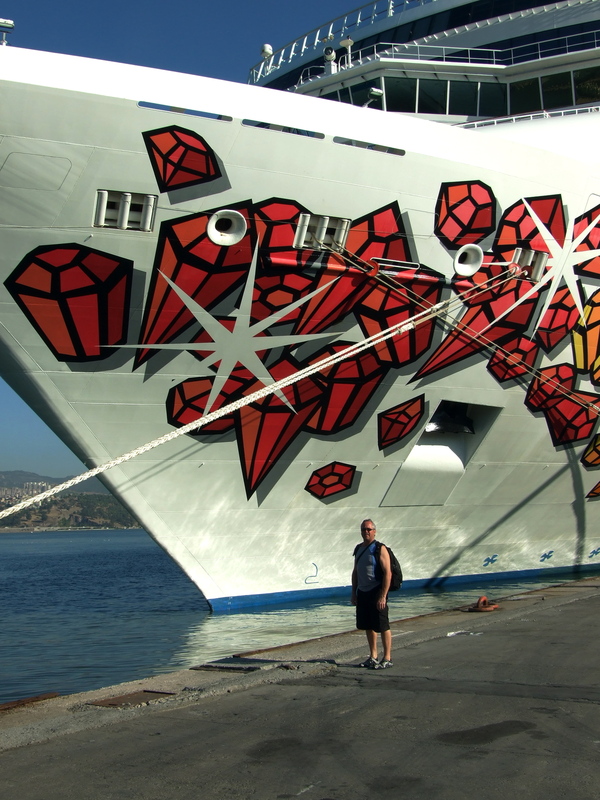 On a ship with 2400 passengers, it’s a rare thing to find any common area not crowded. I’ve been doing some contemplating as I sit here and getting some valuable insight. I realize I have a bad case of the ‘shoulds’ on this trip. Last week, I wrote about feeling like I was being led around on a leash. Now I can see that I was the one pulling the leash. There are so many amazing things to do and see, I’m afraid I’ll miss out on some ‘once-in-a-lifetime’ experience. The problem is, those once-in-a-lifetime experiences are back to back, end to end, piled high and stacked three deep! And…there’s no end in sight (except maybe when we step off the plane in Calgary next Friday). I think that time has come. The voice I hear is telling me it’s time for bed. This ‘once-in-a-lifetime’ experience will have to wait for another lifetime!